First, I made a watercolour piece just using a piece of watercolour cardstock and some cheap watercolour paints, then I let that dry. Then, and this is where the NBUS stuff came in, I cut some frames with my Simon Says Stamp 'Frames' dies - and yes, I should have shares in SSS! 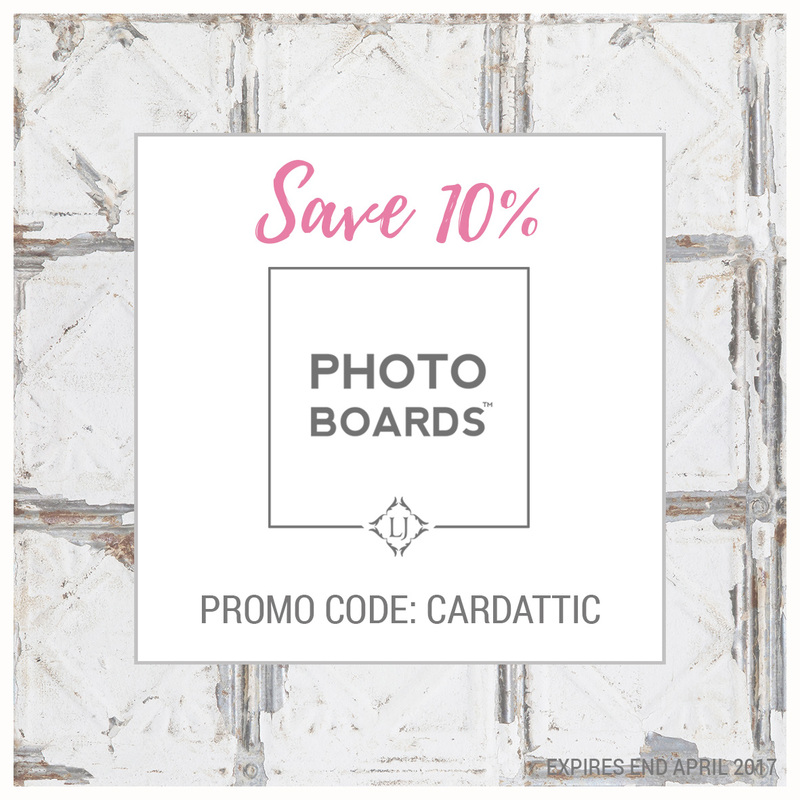 The reason that I had not used the frames before is that they are sized to fit the US A2 card size and all my cardstock was in UK A4 size, which is a little taller and a little thinner, so using US dies on our cardstock is always a compromise . . . anywho, I splashed out and got some US cardstock, from, yes, you guessed it, SSS . . . and what a difference it made! I was chuffed to bits, when my newly cut frames, fitted my Neenah Solar White cardstock perfectly! No more chopping off the bottom of a card, and I can now use the biggest die, whereas before I could only use the next size down . . . amazing! For those of you who don't know the difference in sizes, US standard cardstock is 8.5 inches by 11 inches, whereas, UK standard A4 cardstock is, 21 centimeters by 29.7 centimeters (approx 8 and seveteen sixteenths inch by 11 and eleven sixteenths inch) . . . I know, daft, right? Well, it's ever since we went metric way back when. Up until then we used inches too, but now it is all in centimeters and millimeters . . . I sometimes wish I lived in the US . . . sigh! Anyway, enough of my ramblings, I do hope you haven't nodded off and are still with me, here is the card. I couldn't make my mind up today, which pic was best, the one with the cluttered background that showed the textures up nicely or the one where I moved it to a less cluttered background, but didn't show the textures so well, so I decided after much deliberation, to let you choose! Hazel, a beautiful card! Thanks for visiting my blog and commenting! I should have stock in some scrapbook companies too! I think mine would have to be Memory Box dies! Hi Hazel! This is amazing ! I love seeing all the pictures ! Beautiful card, Hazel! I love the SSS frames dies; they are so versatile. Youre card is very beautiful Hazel. I didn't know you changed in the UK from inches to centimeters ?! Are youre scoreboards and everything in centimeters ? 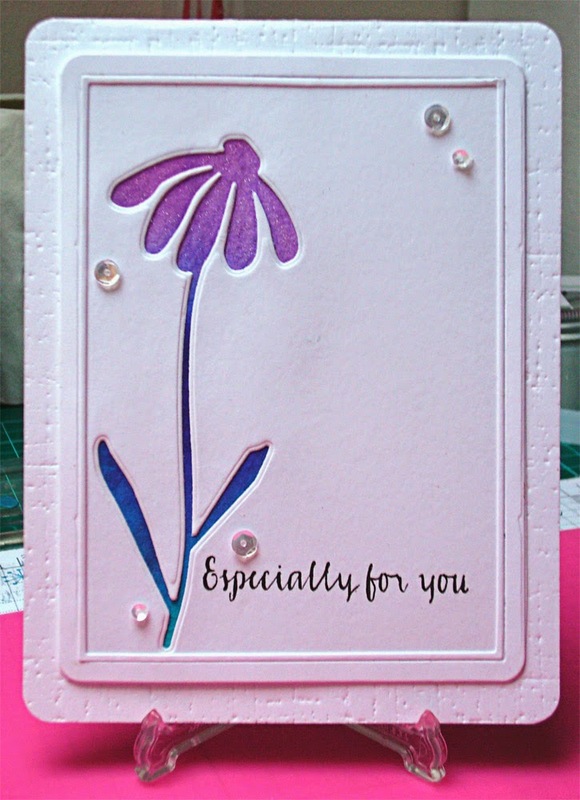 This is a beautiful card Hazel, such a fabulous CAS design. This is gorgeous Hazel. I love the colours you used so nice to see bright colours on a dull and dreary day. I love all the different views that show all the details of this beautiful card! I'm so glad I don't have to convert to cm and mm! So confusing! Hi Hazel. Another gorgeous watercoloured card. Love the idea of using the negative from a previously cut die to use over the watercolour paper ... I have never thought to do that --- crazy, huh??!! This looks amazing! And glad you are now able to use the frame dies easily without having to cut off bits. Also LOVE the texture of your base card ... so pretty and adds a lot of texture to the card. 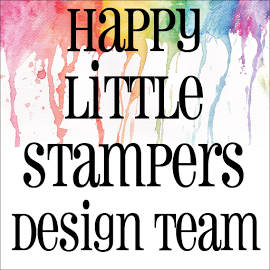 Thanks so much for playing along with us again at Happy Little Stampers! This is lovely Hazel! I love the negative die cut panel...I need to start using those too, if only I could remember to cut in the center of a panel! 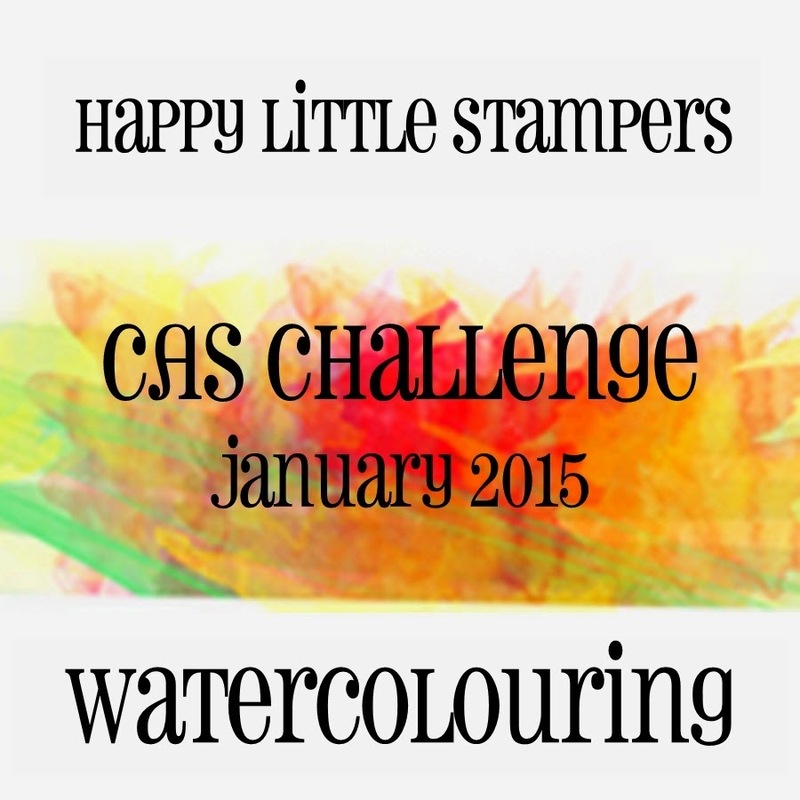 Your water colouring is magical, love the blue stem! Simply beautiful! I'm glad you were able to use your dies! This is so pretty! I love the colors. Lovely card Hazel. 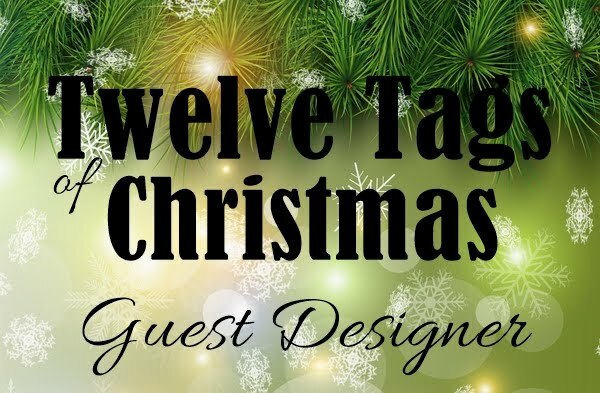 Glad you stopped by my blog, so I could find yours too! This is beautiful! I love the colors showing through the negative die cut. That's such a great look! Oh my, your card is gorgeous! 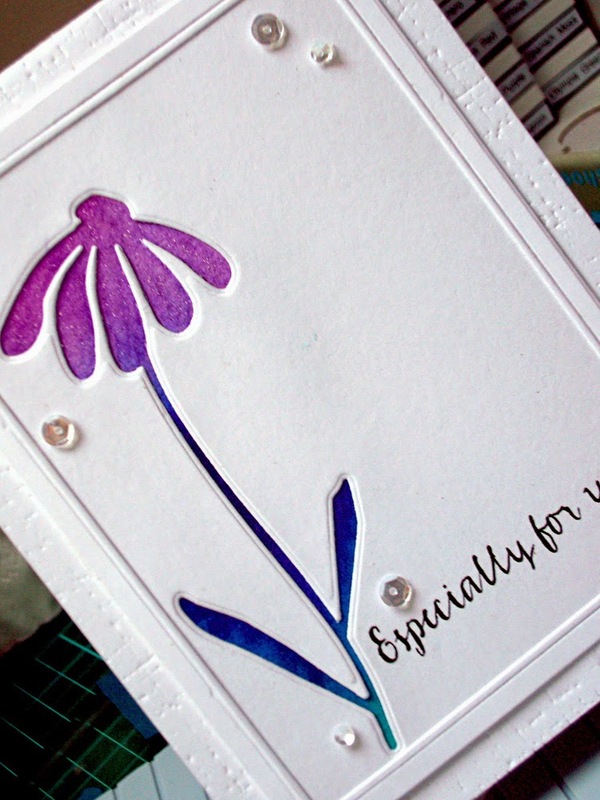 The white space gives the colors of your flower extra emphasis. I am so with you on buying stock in SSS! I can never decide when taking photos of the cards either. I say, good for you, just post both. Hazel, this is so so pretty and I love that coloring on your sweet posie, just perfect! And your background, amazing. And you used the negative of the die cut perfectly! Again love those colors you chose. This is simply gorgeous, Hazel! I love using the negatives over watercolored or patterned paper! It's such a great way to use it and your design here is flawless! Did you also use an impression plate on the card base itself? I see texture there behind your frame. 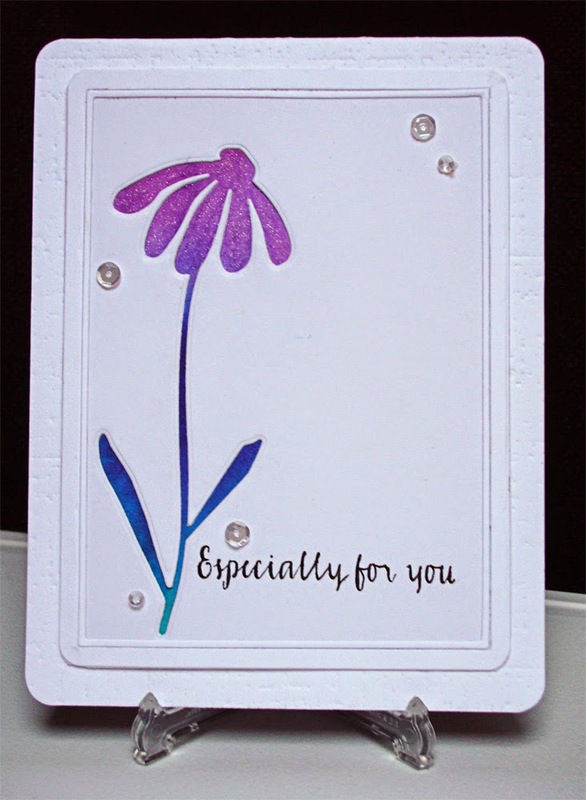 Hazel, your card is beautiful so elegant and a fabulous CAS design. Hazel this is a beautiful card...gorgeous water coloring!! (And I love all the photos)!! This is such a beautiful CAS card! I love how you colored that gorgeous flower and framed it! Who knew cardstock sizes were different in other parts of the world! Thanks for letting us know that tidbit! Nicely done, Hazel! 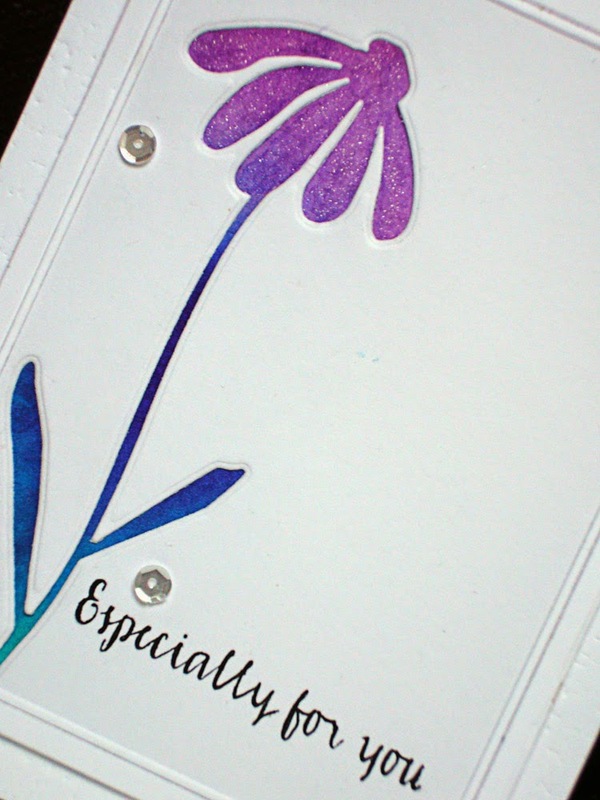 Love the textured cardstock on the base, and your stamping is fab.